The videos below demonstrate how supernumerary limbs can be used to assist in tasks. This research was done in the same lab that Federico works in. Federico Parietti is currently a PhD candidate at the Massachusetts Institute of Technology, where his research focuses on the design and control of wearable robots and man-machine interfaces. 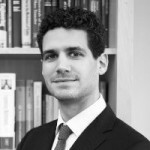 Previously, Parietti was a Research Associate and Visiting Scholar at Carnegie Mellon University and an International Student at ETH Zurich, in Switzerland. Audrow Nash: Hi, welcome to Robots Podcast. Can you introduce yourself? Federico Parietti: I work on wearable robots at the Mechanical Engineering Department at MIT. I’m happy to be here with you today. Audrow Nash: We are too. Can you tell me the goals and motivation behind your research? Federico Parietti: I work on wearable robots – essentially robots that you can put on. These robots are built to give humans something new with respect to what they have in their natural bodies: they can make you stronger, can make you faster, or can provide you additional information, like for example, the Google Glass. What I’m working on right now is physical augmentation; by wearing my robots, a human can essentially become stronger, or avoid fatigue, or they can acquire skills that were not possible before. Audrow Nash: Can you tell me what it looks like? Federico Parietti: Essentially, it’s two additional arms. 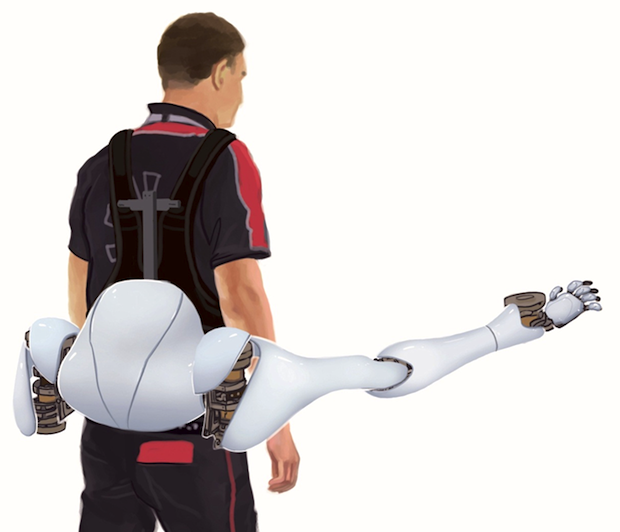 When you’re wearing the robot, you’re essentially wearing a type of backpack harness and you’re carrying around two additional arms that can help you do tasks, coordinate with your hands. It can also reach for the ground or reach for the environment and support you. Audrow Nash: And also they’re located at the wearer’s hips? Federico Parietti: Yes. And since as you point out these two additional arms are essentially springing out of your hips, they can act as legs, but they can also act as arms. They can reach where you can’t reach, even behind you almost like a tail, so there’s really no limit. That’s why we call them additional limbs, because there’s not really a particular definition. Audrow Nash: So how is this different from exoskeletons, with the extra limbs? Federico Parietti: That’s a very important point, because these limbs are independent. They can move on their own without having to copy the motion of the human. In an Ironman style exoskeleton, the robot has to follow the human, so that as you move the robot follows you because the robot is built as a suit. In our case, the robot is wearable, but it’s also independent. So you can move, you can do whatever you want, and the robot is free to coordinate in an independent way. Some people say this is a “Doctor Octopus” kind of robot, because their arms are independent. Audrow Nash: What kind of sensors and actuators are on the wearable system? Federico Parietti: Each one of the two robotic limbs has three actuators. We have two rotation motors in the shoulder of the robot and they can pick the direction where the robot moves. And then the legs are telescopic so they stand and retract. This means that the robot can essentially reach any point in space, within a workspace that is essentially a sphere. On the robot we have four sensors and position sensors so the robot knows where it is and what it’s touching and how strong it’s pushing. And then we also use sensors on the human, which is very important because we have to detect human motion, and sometimes also human muscle activity and brain activity. And we also have some experiments on gaze, so we can detect where the human is looking so the robot coordinate. Audrow Nash: The arms are attached using a ball-and-socket method. Can you tell me a bit about that and the advantages of it? Federico Parietti: The arms are attached to the base of the robot through a ball and socket – a joint that is a sphere. And it’s what we have essentially in our shoulder that allows us to rotate our shoulder around in all directions, because it’s like a sphere. The advantage is that whenever the robot is pushing on the ground, the forces go from the ground through the center of that sphere, and this means that you can sit on the robot arms without wasting energy. The robot stays there and you don’t really need the motors to lift you. Audrow Nash: Can you give me some applications and situations where these supernumerary limbs might be used? Federico Parietti: Our first scenario of application was aircraft assembly. We visited aircraft assembly factories and realized that for some tasks there were two or three workers collaborating for the same task, but only one of the two or three was doing the important task, for example drilling. The other two were just helping with boring and very tiring tasks like lifting parts or following the first worker with a vacuum cleaner. So we asked, why can’t a robot do that? Why can’t a wearable system do that and help the two workers? Then we also realized that a lot of workers get tired because they have to work in uncomfortable positions. A robot like this can compensate for the weight of the user and make working much easier and less tiring. And then finally we also realized that there are a lot of people that, either because they’re rehabilitating or because they’re old, they need additional legs or additional arms in order to keep a comfortable lifestyle to avoid the risk of falling down. And so this robot can also help them. Audrow Nash: So when they’re taking their step one leg is in front of the other and the weak directions are perpendicular or diagonal to the way they’re heading? Federico Parietti: Yes, this is is a very interesting point. When we walk we are unstable and so we risk falling down, and falling is very dangerous for us because we are bipedal – it’s catastrophic essentially. The curious thing is that even in martial arts, like in judo for example, when you have both feet on the ground, if you push in the direction that is perpendicular to the line that joins your feet, you fall down. So a lot of martial arts techniques block your legs and then push you in a perpendicular direction so that you fall down easily. That’s the weak point, but how can we use a robot to improve it, to actually remove that weakness? If we put the robot in the weak direction, then you can’t fall anymore because even if you slip in that direction, there is a robotic leg already in the ground there. So the idea is that when we walk, the robotic legs swing where our legs are not and so we’re always very stable. Audrow Nash: So they swing similar to our arms being opposite to the foot that’s stepping forward? Federico Parietti: Yes, it’s something similar to that essentially. Audrow Nash: And they plant themselves on the ground in theory? Federico Parietti: Actually for the purpose of balance assistance, they don’t even need contact with the ground; they just need to be in the right place close to the ground. Audrow Nash: How does this research compare to similar work? Federico Parietti: The fact that our limbs can be both arms and legs makes us both similar and different to a lot of robots, both robotic manipulators that are typically arms, and to exoskeletons that are typically legs. Let’s talk first about the legs. There are a lot of exoskeletons right now that are used by paralyzed people to walk again so that they don’t have to use a wheelchair. These exoskeletons follow the legs, and they move the legs along a trajectory. They essentially do only one step after the other, but they can’t really keep balance so users still have to use their arms and crutches to balance. Our robot would be complementary with these exoskeletons, so that if you’re paralyzed, you can use a simple exoskeleton to move your legs and these additional “robotic crutches” to avoid falling down. There are also robotic walkers that have been developed for elderly people, but these are essentially robots with wheels and so you can’t go up and down stairs, and they still require the elderly person to use their hands. In our case you don’t really need to use your hands, the robot just follows you. Audrow Nash: What are some challenges of this research and what are some lessons learned from these challenges? Federico Parietti: There are so many challenges. One of them is to make the robot comfortable. People have to wear this robot, so you have to make it as easy to wear and as light as possible. Weight might seem an easy thing to do, but if you need a robot that can lift you, you’re going to need some mass, and some pretty strong actuators. Right now, the goal of having the robot light, but still functional and powerful is really driving us towards exotic materials like carbon fiber or fiberglass. We can’t use metal anymore; it’s too heavy. That was one lesson learned: try to make it as light as possible, because that’s essential for users. Another challenge is the interaction with the human, because we have independent arms – so just copying what the human is doing is not enough. We need to have some kind of independent source of information from the human. We have to find a way so that the human can control these legs without sacrificing anything. So for example, if we use our arms to control robotic arms, additional robotic arms, that would essentially miss the point, because we’d still be using our two arms, right? How can we use human actions to extract independent signals so you can drive additional arms without limiting your own? For example, we’ve strapped an accelerometer to a person’s legs so that when they are just walking normally, we are detecting the frequency of the steps. The robot knows when they are stepping without them having to tell the robot, and the robot can just synchronize with their steps autonomously. The idea is that you can still do whatever you want with your arms and you can walk at any speed with your legs, but the robot synchronizes without you telling it how. Of course this is a simple periodic example, but we are interested in how we can we keep this a very intuitive interaction. Audrow Nash: Once you have an intuitive interaction, do you think you’ll have the arms and legs swapping back and forth? Like being used as both, within the same system? Federico Parietti: Yes, there’s really no limit. Once you have a good interface, you can do whatever you want. You can use the robot to pass you objects that you need, but if you’re using your hands you can’t really reach for them. You can use it for locomotion, for safety … We actually don’t know how many uses there are for additional arms, because that’s not in our nature; no one has ever had additional arms. I bet that if we provide a reliable human-machine interface people will just come up with new uses. Audrow Nash: Going forward, what are your plans and goals? Federico Parietti: It would be good to bring this robot out of the lab and into society, either for manufacturing applications and helping workers, or for rehabilitation, or assisting elderly people. We already have a lot of patents either filed or about to be filed on these robots. It’s a pretty solid and unique technology because of the independence of the arms, and we think it’s very promising. This is a very good moment for start-ups and ventures, and this could be a good application. Audrow Nash: What advice do you have for beginning researchers? Federico Parietti: Do what you like. Refuse to do something that you don’t like, because it’s hard. This is the fourth product I’ve built in the last three years, so it’s a lot of work, it’s a lot of learning, there’s a lot of obstacles and sometimes nothing works. The only way to survive is if you love what you’re doing. So if you love it, there is really no problem, you can do whatever you want. I would say to researchers to pick the field that you really love, stick with that even if people tell you to go elsewhere, because doing what you like is essential to actually doing it well. Audrow Nash: It’s interesting that you brought up how many iterations you’ve done with this. Can you talk a bit about that? The rapid turn-around time you’ve had? Federico Parietti: I think it is a little bit extreme in our lab; no single product for me has ever lasted more than six months – and this is not because they break, it’s because we move on to the next thing. We review a product to test a new control idea, or to test a new design idea, and then we see if it works or if it doesn’t, and then we start immediately to build a new product that takes in account those lessons. That’s how we realized the robot that we have now, which is much, much lighter with respect to the first one. We realized, for example, that joint torque is not that important if the robot is heavy. It’s much better to have a slightly weaker robot but also lighter robot IF you use those torques in a smart way, like with the ball and socket joint for example. So right now we are talking about the latest product, but in six months we’ll have a new one. Audrow Nash: Do you think all these iterations are beneficial? Federico Parietti: Yes, it’s very beneficial. Sometimes we come up with applications that are new, and if I was stuck using my first product, I wouldn’t be able to use the robot for it because it was designed to do something else. All these iterations allow us to be very active and follow the hottest topic; we can incorporate the feedback that we receive at conferences very quickly. Audrow Nash: Wrapping up, what do you believe is the future of robotics? Federico Parietti: I see the future of robotics as divided in two huge areas: there are autonomous robots and there are wearable robots. The goal of autonomous robots is to be as intelligent as possible in order to act as a support or helper to the human, but an independent helper – a kind of robot butler. And then there are wearable robots, and their goal is not really to help as an external agent, but to make the wearer better. It’s essentially human augmentation, and that’s the field I’m working in. The challenge for us is not really to make the robot smart or to give it artificial intelligence. Our challenge is to figure out how to make the robot as useful as possible to a human. It’s not an easy challenge, because we don’t currently have sensors that tell us what the human is thinking, or what the user wants to do. Our robot must be very smart in understanding what the user wants to do and doing it in the best possible way. Essentially we’re in the process of building extensions to the human body, so we need to understand both the mechanical and the neural part of the process, and that’s the challenge that I think is unique to wearable robots.